We do not know what it is, how it is going to be used, or why it was created. Quite frankly, it does not matter. Domestic “Ultimate Battle 22” Release Confirmation? Zstore.com has “Ultimate Battle 22” up for pre-order, though clicking through on the link will bring you to a page that does not list the item. This more or less confirms the release date of 26 March 2003 other sites have been giving for the game domestically. For now, you may be better off ordering the game at ebgames.com, which has it for a mere $19.99. Thanks to Gregor on alt.fan.dragonball for the tip. You can currently find the “Red Ribbon Army” DVD box set (two-discs) up for pre-order on Amazon for a ridiculously low $22.46! It does not come out until the 25th, but if you know you are going to be purchasing it, do yourself a favor and save a bit of money — FUNimation’s ZStore.com has it listed for $39.95. Thanks to all the folks at alt.fan.dragonball and our visitors e-mailing in for the tip. Ultimate Battle 22: Domestic Or Not? Apparently, Infogrames really is translating “Ultimate Battle 22” for PS1… at least in Australia. According to the Australian site, the game is being released on March 14th of this year. However, their main site (and more specifically, the DBZ games section linked off the main page) makes absolutely NO mention of this game. Thanks to the kind folks in this MadMan forum thread for pointing out the link to the Australian site. Today is the day! Dragon Ball Z: Budokai finally hits North American PlayStation 2 systems, bringing the fight back home for the first time since 1997’s Dragon Ball: Final Bout on the original PlayStation. Dragon Ball Z: Budokai was developed by Dimps in Japan and is available exclusively on the PlayStation 2 beginning today for $49.99. BEVERLY, Mass., Dec. 4 /PRNewswire-FirstCall/ — Achieving an incredible convergence between one of the leading anime and television properties ever created and the interactive entertainment world, Infogrames, Inc. (Nasdaq: IFGM) today announced that it has shipped Dragon Ball Z(R): Budokai(TM) for the PlayStation(R)2 computer entertainment system. Already heralded for its authenticity, depth and excitement, Dragon Ball Z(R): Budokai(TM) is hitting store shelves in time for the holiday season. Dragon Ball Z(R): Budokai(TM) spans from the Saiyan(TM) Saga through Cell Games and allows players to experience the fantastic confrontations that define the Dragon Ball Z(R) universe. Choose from five heart-pounding fighting modes, including Story Mode, where players reenact some of the most exciting fighting scenes from the animated series, and Tournament Mode, where players can face off to crown a single Dragon Ball Z(R) fighting champion. A true parallel to the television series, which was the top rated show among all U.S. cable TV programs for boys 9-14, tweens 9-14 and men 12-24 during this season’s launch lineup, Dragon Ball Z(R): Budokai(TM) puts players in some of the show’s most intense battles and heightens the star quality of the game via the inclusion of the actual voice actors from the show. To date, the Dragon Ball(R), Dragon Ball Z(R) & Dragon Ball GT(R) franchises have generated more than three billion dollars in related merchandising and over 500 animated TV episodes. Featuring 23 of the most famous Dragon Ball Z heroes and villains in full 3D, Dragon Ball Z(R): Budokai(TM) spans 29 levels, and features over 60 different combo moves per character, including some of their infamous signature attacks from the animated series. Developed by Dimps, Dragon Ball Z(R): Budokai(TM) is currently available for the PlayStation(R)2 computer entertainment system at a suggested retail price of $49.99 and rated “T” for Teen. For more information on this title, please visit www.dbzgamer.com. BEVERLY, Mass., Nov. 12 /PRNewswire-FirstCall/ — Infogrames, Inc. (Nasdaq: IFGM) is proud to announce today that its upcoming Dragon Ball Z(R): Budokai(TM) video game, exclusively for the PlayStation(R)2 computer entertainment system, will ship to retail December 4, 2002. The Dragon Ball(R) and Dragon Ball Z(R) franchises are global blockbusters that have generated over $3 billion in related merchandising sales worldwide and over 500 animated episodes. In addition, DBZ was the number-one rated show among all U.S. cable TV programs for tweens 9-14, boys 9-14 and men 12-24 during this season’s launch line-up. With the game available for the holidays, Dragon Ball Z(R) fans and fighting game aficionados alike will be able enjoy more of this popular franchise by entering the world of this highly-rated animated series on Cartoon Network and engage in high-intensity fighting battles, each one more epic than the one before. Featuring a totally authentic, high-energy Dragon Ball Z(R) fighting experience, the Dragon Ball Z(R): Budokai(TM) game invites players to relive some of their favorite moments from the Dragon Ball Z(R) animated series by becoming their favorite Dragon Ball Z(R) character and conquering all challengers. Dragon Ball Z(R): Budokai(TM) spans from the Saiyan(TM) Saga through the Cell Games Saga and allows players to experience the fantastic DBZ universe. The game features five heart-pounding fighting modes, including Story Mode, where players reenact some of the most exciting fighting scenes from the animated series, and Tournament Mode, where players can face off to crown a single DBZ fighting champion. The game includes 23 of the most famous DBZ heroes and villains in full 3D, spans 29 levels, and features over 60 different combo moves per character, including some of their infamous attacks from the animated series. The Dragon Ball series, originally developed in Japan, has become the number one animated series in many countries including Japan, France, Spain, Hong Kong and Mexico. It is the top rated series on Cartoon Network’s Toonami block and the “Most Searched for Term of 2001” according to the Lycos 50 Daily Report on the Internet. For additional information on Dragon Ball Z, visit www.dragonballz.com. Forgive me for the sad plain look of this page, but it is all I can muster at the moment. I was browsing alt.fan.dragonball as usual this evening, and began reading a thread I truly did not want to have to read. 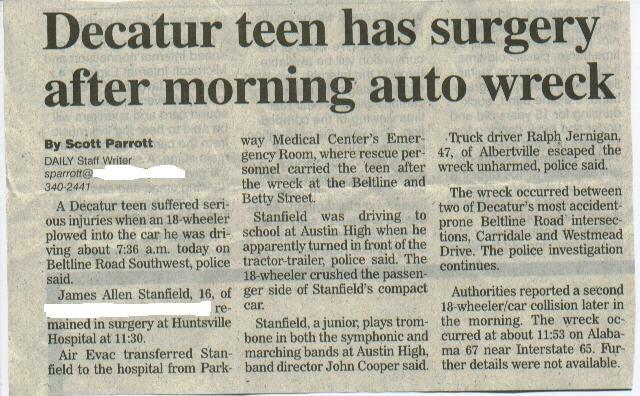 Jim Stanfield, a regular poster on the group and a long-time friend and help of “Daizenshuu EX,” was struck on the passenger side of his car on the way to school by an 18-wheeler, and passed away soon after. Jim was always a helpful person, and while I had never personally met him, he will always be remembered as a friend. 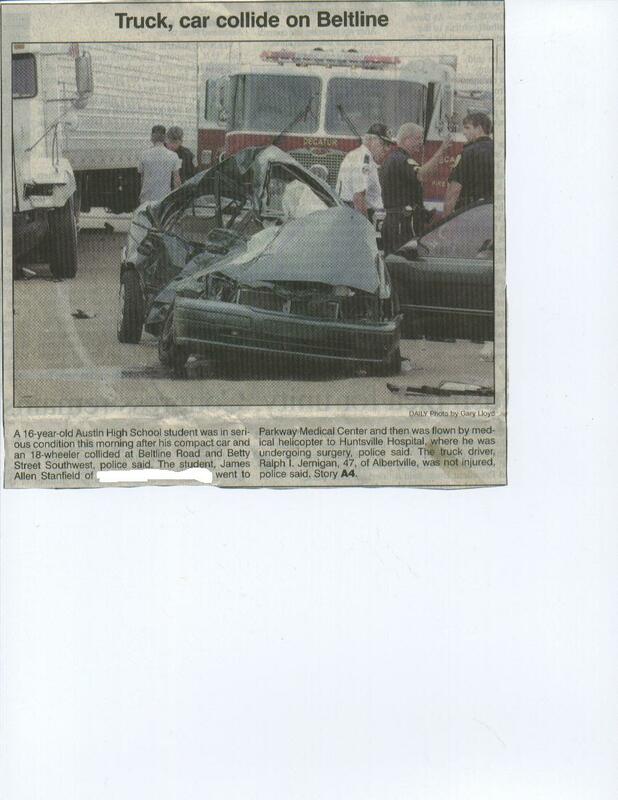 Matthew Caesar was kind enough to post two newspaper clippings regarding the subject. Where-ever you are Jim, thanks for everything in the past. We’ll all miss you. MINNEAPOLIS, May 14 /PRNewswire-FirstCall/ — Infogrames, Inc. (Nasdaq: IFGM), one of the largest third-party publishers of interactive entertainment software in the U.S., today began shipping Dragon Ball Z(R): Legacy of Goku(R) for Game Boy(R) Advance to more than 20,000 retail outlets nationwide. Critically acclaimed with the dedicated video game media, Dragon Ball Z(R): Legacy of Goku(R) is one of the year’s hottest consumer properties with initial shipments of the game exceeding 300,000 units, thus making it the largest Game Boy Advance property in Infogrames’ history. One of the most exciting properties brought to the interactive entertainment arena, Infogrames’ Dragon Ball Z(R) video game has been selected by Nintendo of America to participate in a variety of select retailer programs. Most notably, the inclusion of Dragon Ball Z(R) on Nintendo’s video compilation is running on more than 10,000 interactive stations at leading retailers nationwide, and in Nintendo’s POP/Merchandising program. Additionally, Infogrames is supporting the launch of the game with a multi-million dollar marketing campaign highlighted by a high-energy, thirty-second TV spot airing on the Cartoon Network, Nickelodeon and WB Kids. Increasing online awareness is a high-profile banner campaign via Nintendo.com that offers more than 10 million impressions to the core Game Boy(R) Advance audience, and an online outreach program with Cartoon Network that promises to generate more than 3.5 million impressions. Other elements of Infogrames’ marketing campaign include four-page Dragon Ball Z(R) video game posters in such targeted publications as Nintendo Power, Beckett Dragon Ball Z Collector and Pocket Games. The “Dragon Ball Z(R)” program, produced by FUNimation Productions, LTD., is an exploding phenomenon and has become one of the top-rated anime shows on Cartoon Network’s Toonami Block. Infogrames’ Dragon Ball Z(R): The Legacy of Goku encapsulates the popular sagas from the show into an immersive interactive experience that puts the Dragon Ball Z(R) world under control of the player. Developed by Webfoot Technologies, Inc., Dragon Ball Z(R): The Legacy of Goku will be available nationwide on May 14 for a suggested retail price of $29.99. Infogrames will also be introducing Dragon Ball Z(R): Collectible Card Game for the Game Boy(R) Advance next month. Let me tell you that it took me nearly one month and two states to actually find a place with this disc in stock. Everywhere I went was either “sold out” or “hadn’t gotten it yet.” I finally ended up picking it up on the sixth of January (2001) in Suncoast at my local mall. Argh. The first thing you’ll notice about this particular DVD is the cover. For the first time, FUNimation used an image that was not simply a screen shot from the contained video footage for their cover. The image used is a classic picture of Mirai no Gohan and Trunks, overlapping a backdrop of a destroyed city, presumably by the Jinzoningen. FUNimation’s new “logo” (so to speak) for the contents is the one used on the two “Trunks” volumes of TV episodes, which specifies, “Includes 2 Versions / English Uncut Version / & Original Japanese Version / Subtitled in English”. Basically, it’s the exact same as the dub VHS release, but with the language logo, and the DVD video logo in the bottom right hand corner. The back cover is exactly the same as the dub VHS version, as well, with the added addition of the now standard black bar towards the bottom which explains some basic facts about the contents of the DVD (English/Japanese dialogue – 48 Min. – Not Rated – Color – Stereo/Mono). FUNimation once more loses a point or two for not including any kind of insert what-so-ever. I mean, the least they could do is put in some kind of black-and-white “Add me to your mailing list!” kinda thing. Most companies are kind enough to include a nice color image insert that lists the different chapters included on the disc, and sometimes even more (“Gundam Wing” and their trading cards, “Cardcaptor Sakura” and their postcards, etc). FUNimation and the DBZ DVDs? Zilch. >From here on out, all comments will refer to the Japanese version watched / listened to, unless otherwise noted. With a DVD, you’d expect perfect video quality. Once more, we’re not let down. In fact, I’d say this DVD has the best quality video FUNimation has put out, so far. There’s absolutely NO trace of flickering or rainbows what-so-ever in ANY portion of the video. This is impressive, seeing as how even some more popular titles (“Trigun” for example) have had a problem with this, in the past. However, the video does show its age, and just simply LOOKS old, I guess. Other than that, it’s wonderful. My fansub is pretty good quality (well, it was when I first got it a few years ago.. heh..), but it can’t even begin to compare to the commercial release. The colors are bright when they need to be bright, and more often, dark when they need to be dark. The audio shows no flaws at all, either. Even in the original mono sound, the Japanese audio track is booming, and sounds wonderful. Even on my 270 watt, 7 speaker, Sony system set-up.. if I wasn’t paying that much attention, I’d have thought it was in stereo. There are no crackling noises no break-up, or anything. Superb. Now for the fun stuff. The nit-picks. A problem similar to the original release of the first volume of “Rurouni Kenshin” discs pops up in this one: there’s no timer on the DVD player when the video track is playing. I’m not quite sure, but I attribute this to the fact that there is a lot of switching back and forth between different video tracks. Yes, folks. Remember how on the first “Ginyu” disc, there were separate video tracks (one for the dub, and one for the Japanese version)? Well, something sorta similar is done here. There is one video track for the English dub which covers from the opening theme up through the intro into the title card, and there’s one of the same for the Japanese version (each version has a different title card.. the dub is the “History of Trunks” in English one, and the Japanese is the original, in-Japanese, one). From there, you switch to a video track that is used for both the dub AND the Japanese version. This takes you to the end of the feature, right before the ending theme. In THIS video track, you CAN switch languages at will with the “Audio” button. >From there, it switches over to ANOTHER one of two video tracks used for the ending theme. One is the dub one, containing all English text (which plays if the dub is playing right before this), and the other is the original Japanese one (yes, with the credits still in Japanese, un-translated) which will play if the Japanese audio track is playing right before the switch. With all of these video switches, there is a very brief (one second) stall, which really ruins the flow of things. People buying the DVDs aren’t looking for the English stuff. Just keep one big video track, like all other DVDs, and keep the original Japanese stuff on there. Another option is to put the original Japanese closing as an “extra” on the disc, such as in one of the latest “Rurouni Kenshin” volumes. This will allow for none of the problematic stalls in the video. Why FUNimation (or probably more specifically, the DVD mastering studio) continues to be so unprofessional about it will continue to mystify me. Another nitpick is the lack of eye-catches, once more. And again in this disc, you can hear the very last half-second of the eye-catch music in the audio track when the video begins right where the commercial and eye-catch have left off. Solution? PUT THE EYE-CATCHES BACK IN. THEY’RE CUTE. WE LIKE THEM. There’s also just one minor video edit on the disc, which was also present in the dub VHS release. Right where the second commercial and eye-catch would have been (directly after Trunks’ Super Saiya-jin explosion) there is an odd sort of circular fade-in to the next part. I didn’t care for it, but it did manage to tune out that little eye-catch music that would have been there. Plus or minus, you decide. Next comes Steven J. Simmons and his incredible translations. Never have I seen such insanely accurate subtitles in any release, fansub or commercial. For example, take the word “itadakimasu,” which is the word said at the dinner table before eating. Most translators use something like “Thank you!” or “Let’s dig in!” for their translation, but this doesn’t quite capture the meaning. Along comes Steve with his translation of “I humbly accept!” which is probably the closest you’re going to get to the word in English. More cute perks include the word “Gi” in the dialogue, “Jinzoningen” translated correctly as “Artificial Humans” and not “Androids,” and fun with Gyuu-Maou’s accent (“Sounds as though he’s partnerin’ up with Trunks an’ fightin’ the Artificial Humans”). And then there’s the subtitles, themselves. At first, I wasn’t so sure if I liked FUNimation’s choice of a font. However, after watching a few dozen DVDs, lately, I’ve decided that FUNimation has actually come up with the best choice for subtitles. They’re kinda small, but they’re white, and have a very thick black background. Why is this great? No matter what the backdrop, there’s absolutely NO problem reading the subtitles. DVD releases such as “Trigun” have a moderate yellow subtitle with a very thin black border. At points in the show where the background animation is bright, the subtitles are nearly impossible to read. With FUNimation’s subtitles, you’ll never find yourself wondering what in the heck was just on the screen. Also, the positioning of the subtitles has been corrected from the previous two discs. The two “Trunks” volumes had the subtitles move up on the screen a half-inch, which was not only annoying to look at, but resulted in at least one major problem. The subs on this disc have been moved back down to their proper position, and look great, at the same time. The extras on the disc are rather boring, and quite limited. The same “World of DragonBall” feature that was on the driving episodes’ VHS release and both “Trunks” DVD volumes is present here, again. Commercials for Trunks, Androids, and Cell dub VHS releases are included, as well as the DBZ store commercial (note that all of these are included on all dub VHS releases). A credit-less opening would have been a nice addition. Speaking of the opening, it includes the lyrics (writtin in hiragana) on the bottom of the screen, just like as shown on television. And yes, this opening IS the specific one from the TV special, made obvious by the crediting of the song “Aoi Kaze no HOPE,” which is the ending theme song, performed by Kageyama Hironobu. For a DBZ release, it’s extremely nice. Everything you could want is here, minus the eye-catches, but that was to be expected. For an over-all anime DVD release.. ehh… there’s quite a bit to be desired. Let’s start slapping some inserts and promotions in the cases, get rid of those damn stalls, and find some decent extras (there’s gotta be SOMETHING cool that could be included; I’d really like to see some liner notes by Steve). Anime fan? Steal from a friend for a while. Friend of the website “Zenkai Power” (who also goes by “Cocomox”) has finished a dance remix of Tapion’s theme from DragonBall Z movie 13. It can be grabbed over on his mp3.com page, or from our “Music” section.